When we arrived at Matt’s aunt and uncle’s house today, I discovered that they have a Vita-Mix 5000! Of course, when I saw it my heart started racing, I started babbling something about “yummy” and “green” and…and…and I quickly took it out and started filling it with my favorite goodies for a smoothie! I fired it up and it was blended in about 2 seconds. Literally. Ooooh….it was like heaven. I will be starting a savings account for one tomorrow. I’m in love. oh yes saving for one too. Oh yes…Matt’s already been on eBay saying that there are tons of used ones out there so I’m not worried 🙂 It’s just not a necessity right now (well, it depends who you ask….ha ha). There are so many things I would use it for…not just smoothies. Can’t wait to get one someday! We are visiting some family and they have a Vita-mix. My brother-in-law had snagged it, but when we came to town returned it since he knows how much we’d complain if he kept it the whole time. If there was enough room on the kitchen counter here, I’d leave it out the whole time! I LOVE it!! Its going to be sad when I return home to my dinky blender. Ha. I have been doing my kale/apple juice in my regular blender and its pretty chunky and there is a thick layer of foamy stuff that settles on the top. Not a great consistency. 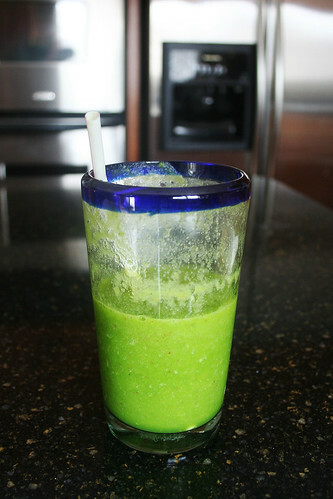 Does the vitamix make stuff more smooth and drinkable? I just found your blog a couple days ago and I’m in love! I love nearly every single one of the recipe’s you’ve posted! Including this one, which I already bought everything I need for it. Starting tomorrow! I also realized that I read your other blog regularly, Walk Slowly, Live Wildly. I never realized these were both yours! Great blogs mama. I also have you on my myspace, lol! God bless! Nicole! That’s amazing. How fun. Michele…if you’re just doing the kale and apple juice without anything else, it will probably be kind of icky 🙂 You should always start with something creamy as your base…bananas work perfectly. A regular blender with a sharp blade should blend it up just fine. Just try adding the banana and see if you like it better. KatisSavedByGrace…thanks for the kind words! I’m so glad you found us here. My mom had one and OH MY WORD was it loud! Like a plane taking off! But yeah…excellent workhorse, that thing! Sara, Are you going to buy your vita-mix used. I can’t decide if I want to risk it. Love the cahllenge and have been inspired by you for months now–thanks. I e-mailed you last week about potentially staying with us when you’re in Sarasota for the tour. I’m not trying to rush you to respond, but just wanted to make sure you got my message and that it didn’t go into your bulk/spam mail or something like that. Would you e-mail me to let me know if you got my message or not? Thanks. They sure do look yummy, though. thanks! I personally opted for the Blendtec blender instead. It is more powerful, faster, and the fact that it is electronically controlled, and auto shuts off was the seller. They are the same price, so either way you go it is awesome. Check out the stuff from Blendtec though. Heck they put up a website called http://www.willitblend.com to show off the power. If it can do a hockey puck, it can do 4 leaves of collard greens. Sara, you have to check out the “will it blend” site. My kids love watching him blend weird stuff. I totally want one. I have been little miss sick-with-the-flu for 2 weeks and I think it is time to get back on the healthy morning smoothie wagon. I need nutrients! p.s. I love your 4 weeks raw pic on myspace. You look great!!! Sara, I’ve been checking out your blogs for ever now and just had to tell you that this post was PERFECT timing! I have been saving for a VitaMix for over a year and just got mine last week and this was my first green smoothie in it! Very exciting! I didn’t have kale so I used swiss chard but it was still delicious! Thanks so much for the great idea! Well I finally got around to trying this tonight. I didn’t have any kale so I subbed spinach and its delicious! So refreshing! I can’t wait to try other green smoothies! Thanks for the recipe! I love your site and have recommended it to lots of friends. 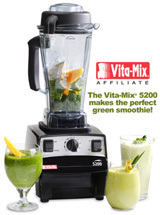 I just emailed Brenda this morning to buy a Vita-mix blender (I included your aff code too – thanks for sharing your love for healthy food with the blog world). I just found out about your blog recently – and love your smoothie recipes. I made a smoothie for me and my two kids (6 and 3) this weekend and I know it would be so much better – and less seeds from the strawberries… because I hate lumps in my drinks – when the new blender arrives! I seriously can’t wait! And my little one gets sick often and I know it’s because he is such a picky eater with LOTS of food allergies and reflux – so eating holds many negative physical feelings for him… and doesn’t eat even close to the amount of vegetables he needs (no problem with the older one thankfully, who will eat artichokes, avocados, green beans, carrots, spinach with me and many of the other stuff I love to eat). So hopefully better health will be attainable with our new blender. Thanks again for keeping a blog!